What Is Procrastination? Understand It, Dance With It, Conquer It. What is procrastination and how do we beat it? Here's a new take on this frustrating universal tendency from some experts that I admire and trust. "the act or habit of procrastinating, or putting off or delaying, especially something requiring immediate attention"
Duh. So how does that help us? Well, WHY do we put off or delay something we need to do? Now, I could tell you all day, until I'm blue in the face, that squashing procrastination is all about small, consistent actions. However, I'm sure you've heard variations on that fundamental before and it hasn't made a difference. So today, I've got something a little different for you from some experts that know what they are talking about. No procrastinating. Take a few minutes right now to scroll through this blog post, read the articles I've linked to and sign up for my ridiculously useful newsletter to get tips like this delivered to you. Seinfeld says to practice consistency. James Clear is the habit master. I've been reading his articles for a while now, and this guy really speaks my language. He studies the habits and routines of successful people and shares them in his newsletter and on his website. How To Stop Procrastinating On Your Goals By Using The "Seinfeld Strategy"
Don't run from procrastination. Dance with it. The Art Of Charm is a fantastic website inspiring and teaching ordinary guys to become extraordinary men. Obviously, I'm not a man and not their target market, but I love their content nonetheless. It's witty, useful and charming (of course). Naturally, I swooned when I read their blog post on using envy, procrastination and fear to your benefit. Check it out. Everybody poops. 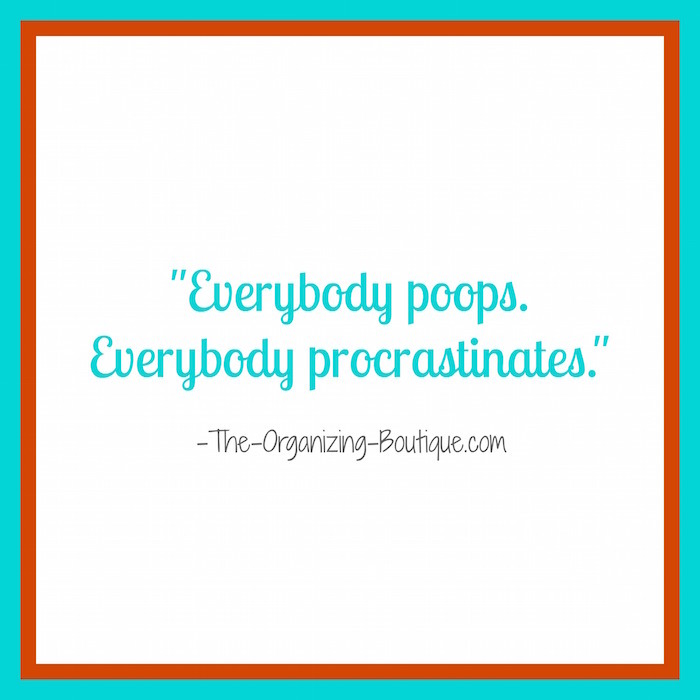 Everybody procrastinates. It's just part of being human. Acknowledging that, sometimes the only way out is through. Here is a guide that appeals to the procrastinator in you and will help you turn your procrastination into productive success. This is for you if you have a closet or a room (or two or three) that you close the door to when people come over to your house to hide the clutter...The Procrastinator's Guide To Getting Organized. And here are a bunch more procrastinator's guides on a variety of topics (estate planning, taxes, writing, etc). If you liked this blog post answering the question, "What is procrastination?" then you'll like this One Focus Booster Tip For Staying On Task During An Organizing Project.